The midfielder of Tavagnacco and Italy has been voted the best female player of the season. 2012-2013 by the coaches of Serie A and she wins the prestigious Italian Golden Ball (Golden Girl Award). Alice Parisi follows last year-winner Elisabetta Tona and wins a long list of nominees who are awarded with the "Silver Ball": Panico, Gabbiadini, Bonansea, Bonetti, Girelli, Guagni and Vicchiarello. 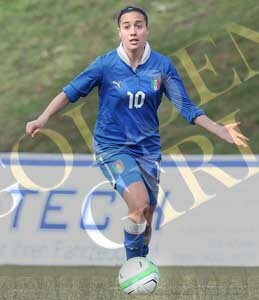 Parisi, born in Tione di Trento on December 11th 1990, can celebrate her birthday with the Italian Golden Ball Award. Alice Parisi begins to play in a bad football team, then debuts in 2005-2006 in the A2 league with the Trento team where she will be playing until the season 2007-2008; in this season, she will lead her team to the promotion in Serie A. She won the European Championship under 2008. In this occasion, she took her first European title by scoring a penalty against Norway. The midfielder of Tavagnacco and of the National team has been elected, as the coach of the Serie A championship, as the best player of the season 2012-2013 and won the prestigious ITALIAN GOLDEN BALLOON (Golden Girl Award). Alice Parisi succeeds Elisabetta Tona and prevails widely on a large list of nominees who win, on equal merit, the "Silver Ball": Panico, Gabbiadini, Bonansea, Bonetti, Girelli, Guagni and Vicchiarello. Parisi, born 11 December 1990 in Tione di Trento, celebrates its birthday with the recognition of the Italian Golden Ball, awarded thanks to its football performances that have distinguished it nationally and internationally. Alice Parisi start playing very young in a men's team and then debut, in the 2005-2006 season, in the A2 series championship with Trento, where she will play until the 2007-2008 season, bringing the Trentino team to the promotion in Serie A. Thanks to her talents, she will wear her blue jersey of the various categories and in 2008 will conquer the European Championship Under 19, bringing to Italy its first European title, realizing a penalty in the final against Norway, won thanks to a great team performance. THE'UEFA will recognize Parisi as one of the 10 best European footballers. In the following season he moves to Bardolino Verona, where he will play until the 2009-2010 championship, scoring 15 goals in 42 matches and winning the title of Italian champion 2008-2009 and the Italian Super Cup. GOLDEN GIRLS, THREE-POINTED ATTACK WITH BRUMANA, GABBIADINI AND MAURO. With the election of the strongest striker of the 2012-2013 season the prizes awarded to the "strongest players for the role" and the "young promises" are concluded. Also thanks to the preferences expressed by the mister of the women's series, the Golden Girls Award completes his "team" with three ex-equix strikers such as Brumana, Gabbiadini and Mauro. We can say that never as in this edition there have been equal kickers on the highest step of the throne demonstrating the balance that was created among the strongest protagonists of our movement. At the place of honor there are seven athletes (ex fair) spaced by one vote: Bonansea, Bonetti, Giacinti, Girelli, Panico, Sabatino and Sodini. Paola Brumana, made his debut in Serie A in the 1999-2000 championship in the ranks of Como 2000 where he remained until 2003 scoring 55 goals in 95 games played. In the following season it passed to Foroni Verona scoring 13 goal and the next one has landed at Bardolino Verona (17reti). From 2006 Paola has moved to Friulana land scoring 111 goals in 140 matches, becoming the leader of Graphistudio Tavagnacco and winning the call-up for the European Championship in Sweden. This season Brumana scored 8 goals and also stood out in the European Championship with his team in the Champions Cup. Read more: GOLDEN GIRLS, THREE-POINTED ATTACK WITH BRUMANA, GABBIADINI AND MAURO. The strong midfielder of Tavagnacco and the national team won the recognition of "Best 2012-2013 midfielder". The place of honor goes to the partner Alessia Tuttino who anticipates Camporese, Carissimi, Domenichetti, Rosucci, Stracchi, Vicchiarello and Zorri, all equal in third place. The "formation of the Golden Girls" is enriched by a midfield of quality, fantasy and quantity, thanks to the preferences of the coaches who consecrate the performance of the best midfielders of our football. Parisi succeeds the teammate Tuttino, already winner of the prize in the last edition, thanks to the excellent performance achieved with Tavagnacco and with the national team where Alice has put on show all her undoubted technical and competitive qualities, thanks to the commitment and football maturity achieved in these years. Congratulations also to all the opponents in the standings and not for the delights that reserve us every race, examples for our young promises and for all the girls who approach the women's football. A big wish goes to an icon of our football: Tatiana Zorri for her coaching career, undertaken this season with excellent results. The next article will be dedicated to the strongest strikers of our league and will anticipate the election of "ITALIAN GOLDEN BALL 2012-2013". Victory ex fair for the recognition "The best defender 2012-2013". To divide the title, the former Italian Golden Ball Elisabetta Tona, Roberta D'Adda and the young Federica Di Criscio. 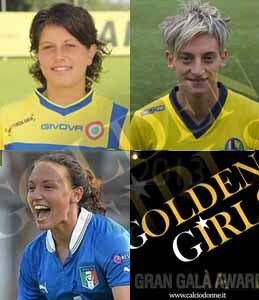 The three blue ones won the recognition "The best defender 2012-2013" emerging, of only one vote, on a wide competition of valuable players like Manieri, Magrini, Motta, Rodella, Squizzato, Tucceri Cimini and the Brazilian of Verona Toscano Aggio, all second with equal merit. 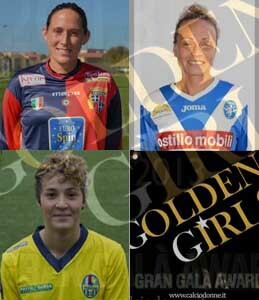 Tona is reconfirmed, every year, the most admired of the defenders with D'Adda, the Brescia and National team and the young Di Criscio (AGSM Verona) who from the second position won in the last season of the Golden Girls Awards - organized by the company Orobica - leaps, in the company of the most experienced bearer of Torres and Brescia, on the highest step of the podium. The ranking, drawn up with the account of the preferences expressed by the coaches of the series A, highlights a great balance between the strongest defenders of our league from which emerged the three stars of Brescia, Verona and Torres.